The Village Board on Feb. 11 debuted the “2019 Prospectus” while attending the annual New York Conference of Mayors event in Albany. 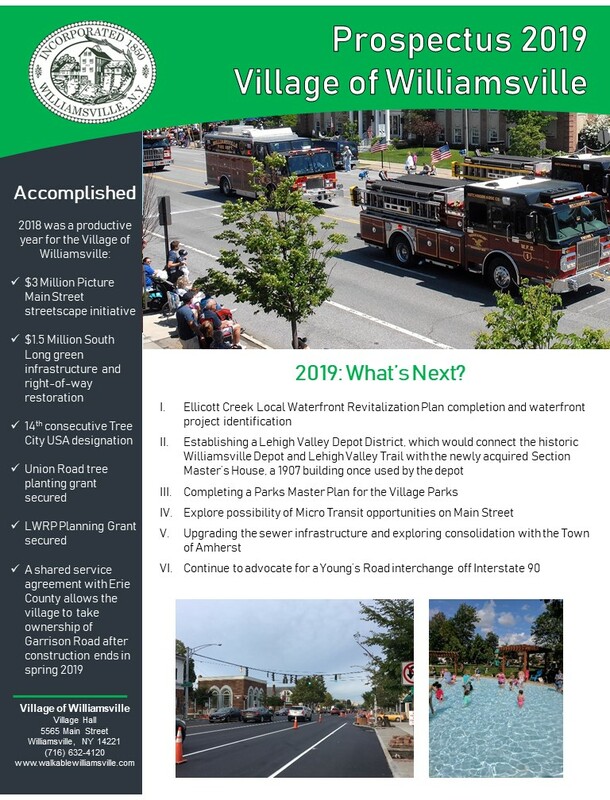 The seven-page “Prospectus” outlines this year’s village objectives, all of which continue the board’s commitment to improving the community for its residents, businesses and visitors. While this year’s village goals are listed below, click here to read Prospectus 2019. Printed copies of the “2019 Prospectus” are available at Village Hall, 5565 Main St., Williamsville. Establishing a Lehigh Valley Depot District, which would connect the historic Williamsville Depot and Lehigh Valley Trail with the newly acquired Section Master’s House, a 1907 building once used by the depot.